SPOKANE, Wash. -- A portion of an underground tunnel containing rail cars full of radioactive waste collapsed Tuesday at a sprawling storage facility in a remote area of Washington state, forcing an evacuation of some workers at the site that made plutonium for nuclear weapons for decades after World War II. 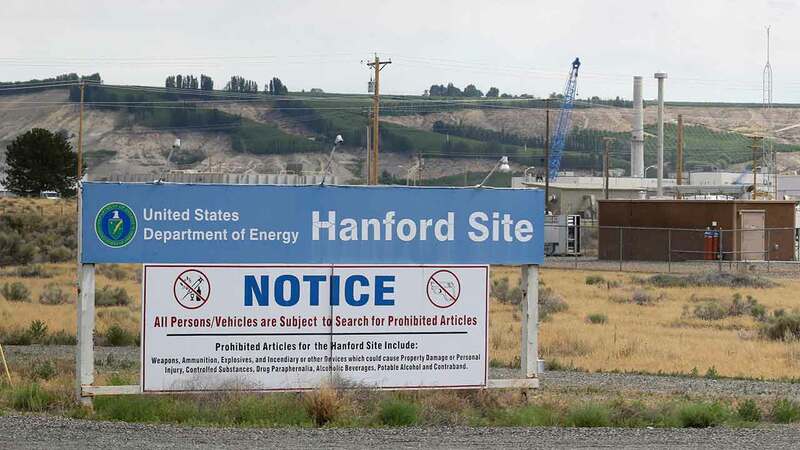 Officials detected no release of radiation at the Hanford Nuclear Reservation and no workers were injured, said Randy Bradbury, a spokesman for the Washington state Department of Ecology. No workers were inside the tunnel when it collapsed, causing soil on the surface above to sink two to four feet (half to 1.2 meters) over a 400 square foot (37.1 square meters) area, officials said. The tunnels are hundreds of feet long, with about eight feet (2.4 meters) of soil covering them, the U.S. Department of Energy said. The cause of the collapse was not immediately known. It was discovered during a routine inspection and occurred during a massive cleanup that has been under way since the 1980s and costs more than $2 billion a year. The work is expected to take until 2060 and cost more than $100 billion. Workers near the site of the collapse Tuesday were evacuated and hundreds of others farther away were told to remain indoors for several hours, the agency said. Some of the 9,000 workers at the site were sent home early along a safe access route. "No action is currently required for residents of Benton and Franklin counties," the U.S. Energy Department said, referring to the nearly 300,000 residents near the site about 200 miles southeast of Seattle. "There is no indication of a release of contamination at this point." U.S. Energy Secretary Rick Perry was briefed on the incident that Washington Gov. Jay Inslee called it a serious situation. "Ensuring the safety of the workers and the community is the top priority," said Inslee, a Democrat who previously represented the Hanford region in Congress. The anti-nuclear group Beyond Nuclear said the incident helped show "radioactive waste management is out of control." The accident occurred at a plant known as the Plutonium Uranium Extraction Facility, or PUREX, located in the middle of the 500-square-mile Hanford site - half the size of Rhode Island. Hanford for decades made plutonium for nuclear weapons and is now the nation's largest depository of radioactive defense waste, with about 56 million gallons of waste, most of it in 177 underground tanks. As part of a huge, ongoing cleanup, rail cars full of radioactive waste were driven into tunnels and buried, Bradbury said. The Hanford site was built during World War II and made plutonium for most of the U.S. nuclear arsenal, including the bomb dropped on Nagasaki, Japan, at the end of the war. Worker safety has long been a concern at Hanford. Washington Attorney General Bob Ferguson filed a lawsuit last fall against the Energy Department and its contractor, Washington River Protection Solutions, contending vapors released from underground nuclear waste tanks posed a serious risk to workers. Ferguson said that since the early 1980s, hundreds of workers have been exposed to vapors escaping from the tanks and that those breathing the vapors developed nosebleeds, chest and lung pain, headaches, coughing, sore throats, irritated eyes and difficulty breathing. Lawyers for the Energy Department have said no evidence has been provided showing workers have been harmed by vapors.